These Custom Tailored Rear Deck Covers are the finest fitting, highest quality dash covers. This superior fit can be attributed to the way these covers are stitched. 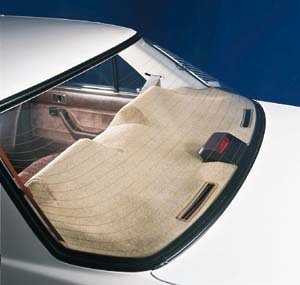 Other manufacturers use the blind stitch, which curls into the seam and lifts off the dash. Only these covers use the OEM approved zigzag stitch, which allows the cover to lay flat against the dash board, and allows small pieces to be sewn together, creating a far better fit. Custom tailored dash covers are available in two fabrics; poly carpet and velour. Poly Carpet is a polyester nonwoven carpet which is our most popular material for dash covers. Velour is a foam backed velour material, with a high sheen. Please note: Rear Deck Covers are no longer available with covered headrests. Other Patterns Coming Soon... Cheetah, and Pin-Up Girls! Note: These dash covers are non-returnable.